North Jakarta Water Resources (SDA) Sub-dept. starts to dredge Bendungan Melayu PHB channel on Jl. Bendungan Melayu, Rawa Badak Selatan and Tugu Selatan Urban Villages, Koja Sub-district.
" 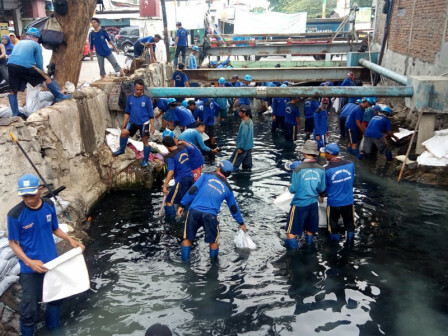 All this time, dredging is difficult to be done because many PKLs occupy the location"
Koja SDA Unit Head, Erlan mentioned, dredging is done as the continuation of arrangement project on Jl. Bendungan Melayu. It is also done to anticipate inundation in rainy season. "All resident's micro channels disembogue to this channel and it flows to Pinang River. All this time, dredging is difficult to be done because many PKLs occupy the location," he said, Wednesday (11/7). He explained, his side will deepen this 10-meter channel from 2 meters into 3 meters. "W e deploy 63 personnel to dredge the channel thus it can be finished about two weeks ahead," he conveyed.